Welcome to Coterie Worklounge and The Cloud Room. 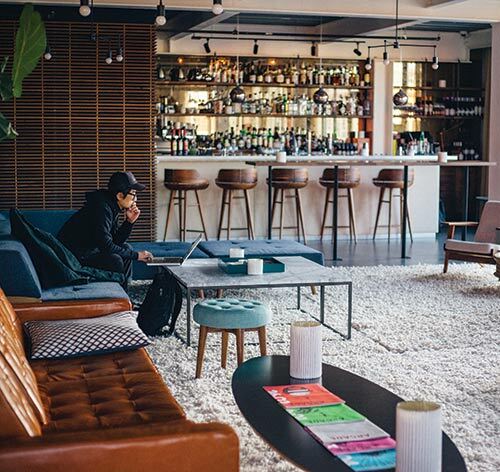 Coworking spaces — where remote workers can rent a desk and access to business services — have been around for years, but some new venues in Seattle are adding another dimension to the concept: a bar. Although separate conference rooms, secluded booths and private phone suites are also offered, a swanky bar is at the center of the Coterie Worklounge, which opened last fall in a grand downtown space on Fourth Avenue that formerly housed a bank. Modern technology makes it easy to stay connected to colleagues and clients outside of the traditional office environment, but there’s still an element of doing business that calls for more than virtual connections, say Coterie’s founders, Leah Richmond and Su-Zette Sparks. “Some of the best ideas start over a drink at the bar, and not necessarily in a meeting room or cubicle,” Sparks notes. Along with drinks, Coterie’s café bar offers breakfast, lunch and happy-hour nibbles — and it’s open to the public. “It’s created a different environment for people to expand their personal and business community,” says Richmond, adding that she’s seen many conversations start up between members (who pay $160 per month) and visitors. Facilitating connections was always part of the plan for The Cloud Room, says General Manager Holly Houser, who describes the venue that opened last summer on Capitol Hill as “a combination of a coworking space and a private members’ club.” Unlike Coterie, The Cloud Room’s prospective members (fees start at $300 per month) must be nominated by current members, who tend to come from creative fields and the arts community. The exclusivity is intended to foster deeper connections and even collaboration among members, Houser says. In addition to offering workspaces and business facilities, The Cloud Room hosts regular events for members and prospective members, including dinners and happy hours in its stylish lounge, which offers craft cocktails created by bar director Jay Kuehner, whom you’ll also find behind the stick at Pioneer Square’s Damn the Weather.